Info "Fronk's in a sticky situation. Again. Save him fast!" Rock and a Hot Place is one of Fronk's microgames in WarioWare: Twisted! The game's name is based on the phrase "Between a rock and a hard place", meaning someone has to make a decision in which both of the outcomes are undesirable. The player controls a Fronk. 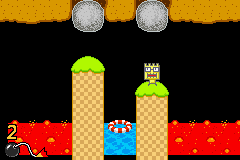 The game's purpose is to get him to the floaty that is on the water pool without falling into the lava or being hit by a falling rock. If done so, the game is won. 1st level difficulty: There is one rock and one lava pool. 2nd level difficulty: There are two rocks and two lava pools. 3rd level difficulty: There are three rocks and three lava pools. This page was last edited on November 17, 2018, at 03:16.